LEAP/SLE 15 is getting more stable and closer to be released, but to keep this process flowing, our team of bug killers is having a lot of work to do! This last sprint we had several fixes for really special scenarios. The kind of problems that you can find once most of things are working fine! So let’s take a look at some of these cases and how we’re working to stabilize this upcoming release. A not well-known feature in YaST is that many specific boot parameters for installation are also used on the target system. However, this approach has one exception: the S390 mainframe. In this case, many installation specific parameters should not go to the target system and, therefore, we ignore all installation parameter for this system. In the last sprint, we worked on a bug, which reported that at least systemd predictable names for network devices should be also used for S390 systems, otherwise the configuration done during the installation won’t be valid in a running system as network names will differ. So, from SLE15 we start to keep the settings of predictable network names for S390 systems. Another report that helped us to learn about other not well-known features was the one reporting that bootloader module does not support multiple console outputs of GRUB2. After digging into some code, we found out that YaST bootloader takes only native terminal, gfxterm or serial console in consideration, but not a mix of them. Once we looked at the manual of GRUB2, we learned that it supports some funny outputs such as morse code, PC beeper or simple data protocol using system speaker. Of course, YaST2 bootloader does not support all these options and when it gets one of them, it is treated as an unexpected value and bootloader fails. As we are really close to Leap/SLE 15 release, we want to avoid big changes in the system. So we decided to handle this issue by showing a popup, which informs that the configuration contains an unexpected value and asks if the whole proposed configuration should be proposed again or if YaST should quit and let the user edit it manually. For Leap 15.1 / SLE 15 SP1 we plan to extend the values that we support to provide a nicer experience for the user. Another reported issue in bootloader was also solved this last sprint. 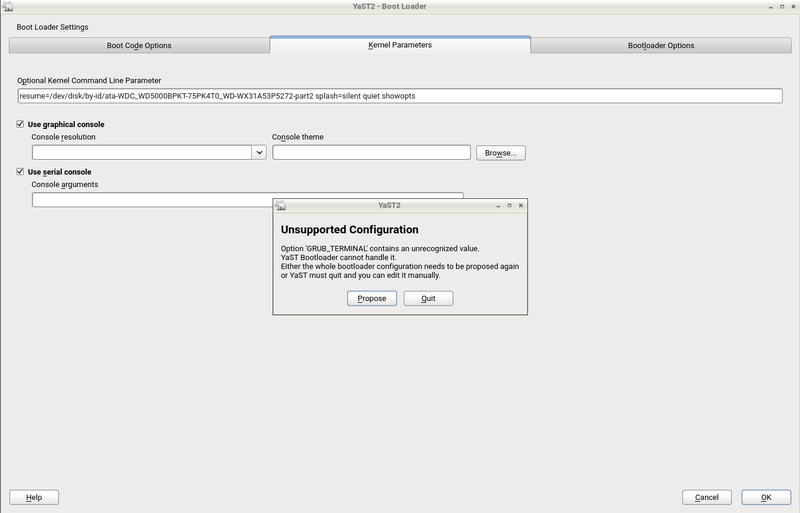 When upgrading from Leap 42/SLE 12 to Leap/SLE 15, if the user clicks on booting on the proposal, the system crashes. The reason is that usually on openSUSE 13.2/SLE 11 it needs to repropose bootloader during the upgrade. This is no longer required for the latest upgrade and, therefore, YaST does not expect that the user will click on it. We would like to remove this option completely, but YaST still support upgrade from SLE11 to SLE15, so we still need it there. 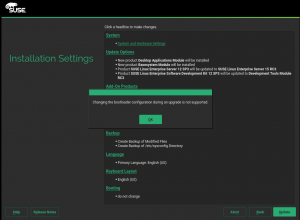 In the end, the solution is to show a popup informing the user that the modification of bootloader is not supported during upgrade. We got a report about kdump breaking when it is used in Xen. To explain the problem, we need to go back to how we configure a parameter and the reasons we implemented it in this way: In current versions (before this fix) when a user wants to use kdump, we configure the crashkernel kernel parameter for all targets, for the common kernel, Xen PV0 domain and also Xen guests. This approach worked very well in the past because traditional xenlinux ignores crashkernel for PV0 and just pass it to Xen VMs. However, the current pvops implementation of Xen no longer ignores this parameter and consequently, it results in breaking the Xen virtualization. The solution for this issue was pretty simple: YaST stopped to propose using crashkernel for Xen PV0 and everything works again. This is a perfect example to show how to understand the issue, sometimes, takes much more time than to fix it! We are still improving the migration from SLE11 or SLE12 to SLE15 and this sprint we were focused on the automated registration upgrade using AutoYaST. If you are not familiar with the autoupgrade feature you can find more details in the documentation. 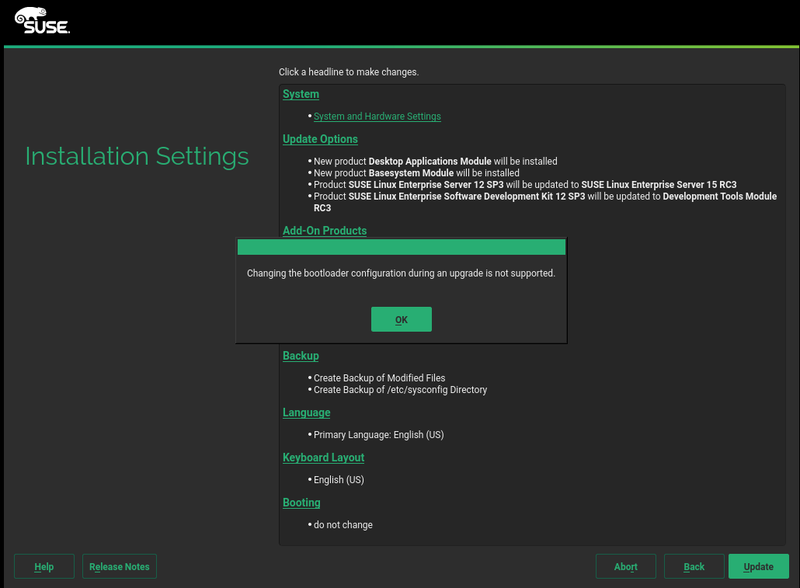 We already supported manual registration upgrade from the old products, but the automated way was still not adapted to the new SUSE Customer Center (SCC) API and it did not work correctly. This sprint we have adapted the registration upgrade code to correctly work in the interactive mode and also in the automatic upgrade. The code was adapted to skip the user interaction and do everything manually when running in the autoupgrade mode. The only problematic part was how to handle multiple migration targets, which in the interactive upgrade we ask the user to choose one. 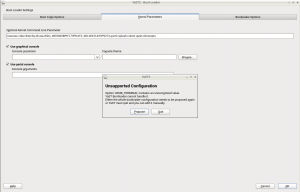 To have a simple solution we decided to take the first migration, later (SP1) we might allow configuring this as well. But as now there is only one migration possible anyway, this looks like a good enough solution. During this sprint, we were informed that AutoYaST was unable to display a proper error message when no partitioning section was specified and there was not enough disk space. The bug was rather easy to solve, but we wanted to take the opportunity to highlight how AutoYaST works when the partitioning section is missing from the profile. In the past, AutoYaST implemented its own logic, different from the one used during a normal installation. Fortunately, as part of the adaptation to the new storage layer, AutoYaST relies now on the same code than the regular installation in order to propose a partitioning layout when the partitioning section is not specified. What is more, you can override some values which are defined in the product’s control file by setting them in the general/storage section from the AutoYaST profile. We are really close to release Leap/SLE 15 and we are more focused on minimal changes that fix only critical stuff. On the other hand, Tumbleweed users are looking always for the latest and greatest features. In order to satisfy both groups, YaST separated Leap 15.1/SLE 15 and Tumbleweed in two different git branches. In this way, we can easily start adding new features, bug fixes and other improvements for Tumbleweed while we keep SLE15 stabilized. Besides that, there is another planned Service Pack for SLE12, and once we start to work at it, we’ll also create a new separated branch to include these changes. We also adapted all related infrastructure around the branches, such as CI, docker testing images, among others. This way, we are able to allow you to enjoy the stable Leap 15 or the latest and hottest Tumbleweed. We’re now working on our last sprint before the openSUSE Conference 2018. In two weeks we’ll come back with the highlights of Sprint 57 and until there we hope that you have already everything planned to enjoy the conference that will occur in Prague this year (we hope that you enjoy the city too). We’re looking forward to seeing you there!